Dropping the audience right into the center of a turbulent time in recent history without explaining how anyone ended up there or why, Clint Eastwood’s Invictus demands that viewers take an awful lot for granted, in good faith and little else. A recounting of events during the transformative period in which the iconic former political prisoner Nelson Mandela served as president of post-apartheid South Africa from 1994-1999, Invictus, somewhat like apartheid itself, is plagued with a narrative divide that never quite comes together. And in effect, despite some truly uplifting moments, seems unable to decide whether it wants to be a sports movie or a political biopic. 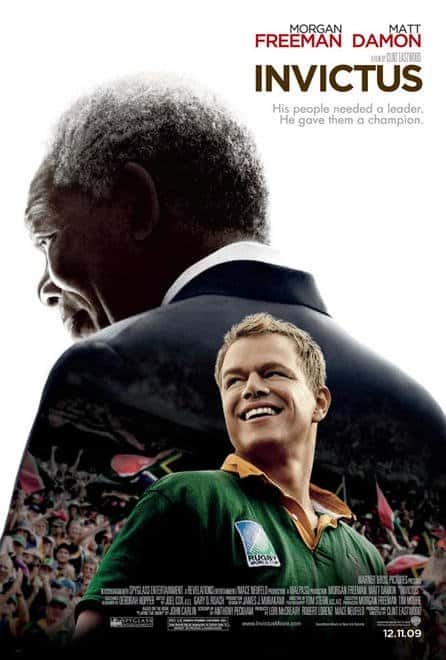 Morgan Freeman is Nelson Mandela in Invictus, the internationally heralded anti-apartheid leader who struggled from his prison cell on Robben Island for nearly thirty years, where he was sent on charges of sedition, to end apartheid in South Africa. Ironically, Mandela would then rise to the highest position in a very recently oppressive land, nearly a decade and a half before the notion that a black man could ever be president came to fruition in the US, a country at least publicly having prided itself on being way more politically advanced than South Africa. Adapted from the John Carlin book, Playing the Enemy, and borrowing its title from British writer William Ernest Henley’s 1875 poem with the famous lines, ‘I am the master of my fate: I am the captain of my soul’ – that Mandela cherished pondering in his jail cell, Invictus would have benefited immensely if it had taken time to borrow more substantially from the historical record as well. As such, the resolution of the country’s profound post-apartheid racial divide is conceived simplistically as key political progress essentially scored via victorious rugby games. And establishing ultimate social reconciliation, not as a meeting of minds between Mandela and say, a white political counterpart, but rather between the president and the captain of the South African rugby team. Sports nut mania or pro-Afrikaner prison Stockholm syndrome? And in effect athletic competition as the great uniter. If only history were that easy to repair. In this manner, the long and arduous struggle of Mandela, along with the anti-apartheid ANC resistance movement, is trivialized, despite Freeman’s otherworldly characterization of Mandela in icon-speak. This, while the ANC is portrayed simply as a disgruntled collection of sourpusses with unimportant grievances, and in serious need of anger management classes. While the ANC and Mandela’s own ideological roots in Marxism are white-washed away, so to speak, with the strangely disappearing elephant in the room – communism – getting a dainty spin in that other frequently uttered ‘c’ word – ‘comrade ‘ – clearly a substitute code word here for communism. And never mind that South Africa’s racial divide continues with widespread economic inequity, rampant crime and corruption, and a still firmly economically entrenched powerful white elite. In other words, kiss and make up truth and reconciliation in the service of the status quo. Also ironic, is another movie out this year painting quite a different, socially chaotic portrait of South Africa – District 9. And interesting as well, is that legendary guy in his own right, Dirty Harry aka Clint, cleaning up his vigilante act here as a newly emerged champion of peace and against retaliation. Even as he just treated us with seeming relish last year to the prolonged suffering of a man condemned to death by hanging in Changeling. And, without a thought about the way this country tends to thrive on a culture of vengeance, with the highest prison population in the world, and disproportionately filled by far, with African American inmates.